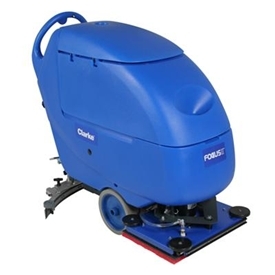 The Clarke-Alto Focus II Boost L20 is a battery powered walk-behind auto scrubber. This unit is equiped with BOOST technology. BOOST Technology offers 70% reduction in the usage of water and chemicals as well as 40% increase in pad life. The unit is quiet and can be used during all hours. The Clarke-Alto Focus II Boost L20 has a large solution and recovery tank creating more productivity and less filling and dumping.